Ten years after Mamma Mia! 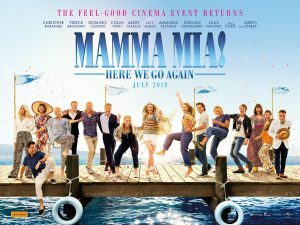 the movie that grossed more than $600 million around the world, Universal Pictures invites you to return to the magical Greek island of Kalokairi in an all-new original musical based on the songs of ABBA. With the film’s original cast returning and new additions including Lily James (Cinderella, Baby Driver). Mamma Mia! Here We Go Again is in cinemas from 19 July. Watch the trailer. Win one of ten double passes to Mamma Mia! Here We Go Again! Entries close at 11:59pm on Friday 29 June. We have our fingers crossed for you Lorna! sadly, hubby and I are just a little addicted to the first Mama Mia! He is just about word perfect which worries me a bit! LOL LOL. Dog scarpers when he gets the CD out – he knows a singing session is about to start. That’s too funny!! Hopefully you both enjoy singing along to movie number two! That’s so cute that they know all the words! We have our fingers and toes crossed for you Sheila! Abba & Mama Mia tragics yes please ! Have just seen the trailer for this movie and would love to see it. It does look like a super fun movie! Absolutely love Kleen Heats special promos and monthly entries. So glad to hear you enjoy them! Hi Ann, so glad to hear you’re happy with our service. We absolutely love rewarding our customers and we hope you win the tickets too!! I would love to take a deserving friend on a great girls night out. Happy customer – fingers crossed I can win tickets to take my 14 year old granddaughter to Mamma Mia who has never been to a show as yet. Loved the first movie, I am sure this one will be just as good. Kleenheat is the best in the West!!! Thank you for your support Linda!! I would like2take my girlfriend whom i have known since 1966 and has gone through chemotherapy. We loved Abba songs our era.